Pictures can hardly do this plant justice. The large compound leaves are dark green with lighter green veins, but it is their undersides that are so striking - almost pure white. 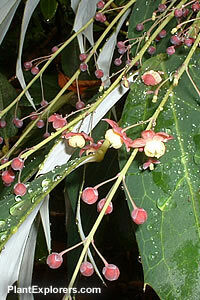 The flowers are unusual for a Mahonia in that they are burgundy and white, rather than the more usual yellow. The widely spaced flowers are produced in mid to late summer and followed by berries in the autumn. This shrub has a very relaxed attitude and tends to sprawl rather than stand upright; height is about 2 feet. Suits a woodland garden. For maximum freshness, please keep seed refrigerated in its original packaging until it is time to plant. Sow seed in containers in a cold frame as soon as your order arrives. If planting is delayed, refrigerate the seed in its original packaging. 3-4 weeks of cold stratification can significantly improve germination. To cold stratify the seed, soak in clean water for 24-36 hours then place in pots of sterilized growing medium and refrigerate for 6-8 weeks. Germination may take anywhere from 3-6 months, possibly longer if sowing is delayed. Grow in moist but well-drained soil in part to full shade.